NASA's Hubble Space Telescope is witnessing a grouping of galaxies engaging in a slow dance of destruction that will last for billions of years. The galaxies are so tightly packed together that gravitational forces are beginning to rip stars from them and distort their shapes. Those same gravitational forces eventually could bring the galaxies together to form one large galaxy. The name of this grouping, Seyfert's Sextet, implies that six galaxies are participating in the action. But only four galaxies are on the dance card. The small face-on spiral with the prominent arms [center] of gas and stars is a background galaxy almost five times farther away than the other four. Only a chance alignment makes it appear as if it is part of the group. The sixth member of the sextet isn't a galaxy at all but a long "tidal tail" of stars [below, right] torn from one of the galaxies. The group resides 190 million light-years away in the constellation Serpens. This densely packed grouping spans just 100,000 light-years, occupying less volume than the Milky Way galaxy. Each galaxy is about 35,000 light-years wide. Three of the galaxies [the elliptical galaxy, second from top, and the two spiral galaxies at the bottom] bear the telltale marks of close interactions with each other, or perhaps with an interloper galaxy not pictured here. Their distorted shapes suggest that gravitational forces have reshaped them. The halos around the galaxies indicate that stars have been ripped away. The galaxy at bottom, center, has a 35,000 light-year-long tail of stars flowing from it. The tail may have been pulled from the galaxy about 500 million years ago. Although part of the group, the nearly edge-on spiral galaxy at top, center, remains relatively undisturbed, except for the slight warp in its disk. Most of its stars have remained within its galactic boundaries. Unlike most other galaxy interactions observed with the Hubble telescope, this group shows no evidence of the characteristic blue regions of young star clusters, which generally arise during galaxy interactions. The lack of star-forming clusters suggests that there is something different about Seyfert's Sextet compared with similar systems. 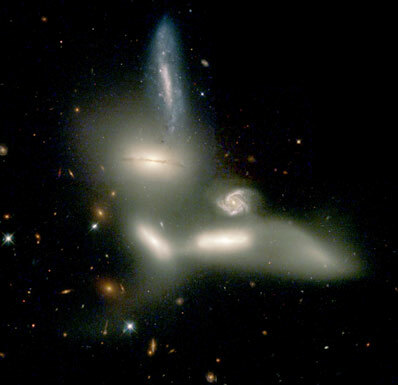 One example is Stephan's Quintet, another congregation of interacting galaxies observed with the Hubble telescope. The difference between the two systems could be a simple one: astronomers may be seeing the sextet at the beginning of its interaction, before much has happened. This will not be the case for long, though. The galaxies in Seyfert's Sextet will continue to interact, and eventually, billions of years from now, all four may merge and form a single galaxy. Astronomers have strong evidence that many, if not most, elliptical galaxies are the result of mergers. Astronomers named the grouping Seyfert's Sextet for astronomer Carl Seyfert, who discovered the assemblage in the late 1940s. Seyfert already suspected that one apparent member of the sextet was not a galaxy but simply a tidal tail stripped off of one of the other members. The image was taken on June 26, 2000, with the Wide Field and Planetary Camera 2.